This event is a series of one-touch bouts with epee swords. The event is a round-robin tournament, with a single touch deciding each match. The fencing event is held in an indoor arena on special strips (pistes) measuring 14m long and between 1.5m and 2m wide. Each competitor has a bout against every other competitor. Bouts last for one minute, the winner being the first fencer to score a hit. The swimming event is a freestyle race over 200m for men and women with athletes seeded in heats according to their personal best time. A time of 2:30 earns 1000 Pentathlon points. Every 0.33 seconds is worth +/- 4 points and thus the value of each swimming second is worth 12 points. The riding event (equestrian show jumping) included in modern pentathlon involves jumping over obstacles of up to 120cm in height. The obstacle course is between 335-450m in length and includes 12 obstacles with one double and one triple, for 15 jumps. Athletes compete on horses provided by the federation, which are selected from a random draw. Riders are allocated 20 minutes warm up on their horse prior to entering the jumping arena where they must have memorized the course. 1200 points are awarded and for each mistake, refusal, or knocking down of an obstacle points are subtracted. The “combined event” is the final event of the day’s competition. Athletes begin at a shooting range where they are required to hit 5 targets before running a 1000 meter run. This is repeated 2 more times for a total of 15 targets and 3,000m run. 2000 points are awarded over a time of 14 minutes. Each second faster or slower than the prescribed time is worth +/- 4 points. This program will begin the week of February 4th and conclude during the week of March 4. Participants will be evaluated on their progress and technique as they are introduced to each discipline. Each participant will walk away with an evaluation of how they performed in each particular discipline. The only “competition” is within the participant themselves. Each discipline will offer two sessions that include technique and practical application of the specific sport. The following progression has been established and each session in each discipline will be 90 minutes long. Feb 4th (Monday) Feb 8th (Friday) Epee Fencing Music City Fencing Club 5:00-6:30 p.m.
Feb 11th (Monday) Feb 13th (Wednesday) Guns and Leather Hendersonville 5-6:30 p.m.
*Please note that the riding portion will be an obstacle course – not show jumping. If we have athletes that have never ridden, we will introduce them to equestrian in a separate session. This will be determined during the first week of our program. March 9th –TBA we will utilize a track at one of our local high schools and do a timed run of 400 meters. All participants in our program are encouraged to run on their own during the five weeks of training. There is no charge for the running portion of this program. *Running will not be coached. Participants should run on a weekly basis. We will arrange a day at the track to time each participant in a ¼ mile run. Cost for the program is $90 per week. You must pay each coach individually at their facility. SPECIAL NOTE: For the Aquatic portion ONLY, if you are currently enrolled in a class at Sea Star Swim School, your fee for that portion will be $30 for the additional coaching. Chris Smith is the senior instructor for these classes, and will be offering personal training as well. Chris’s career spans almost 20 years in U.S. Special Operations, U.S. intelligence/counter-intelligence, and specialized corporate security and risk management consulting in both U.S. Government and the private sector. His career began serving in the U.S. Air Force as a Combat Controller supporting both Air Force Special Operations Command and Joint Special Operations Command at Ft. Bragg/Pope Air Force Base, North Carolina. During his military career, Chris received extensive training in small arms and defensive tactics, demolitions, air and water operations, close air support, hostage rescue, and survival tactics. Chris supported several military campaigns in both the Middle East and Eastern Europe regions, as well as several humanitarian relief efforts. Shortly after serving in the military, Chris received both an undergraduate and graduate degree in business administration and began employment with a large government contract firm in Washington D.C. Chris supported a classified government contract with the U.S. State Department, with extensive international travel to over 84 countries worldwide. Following his government assignment with U.S. DoS, Chris held several management and consulting roles in the private sector either directly supporting or advising corporate security matters for large defense firms supporting the U.S. Department of Defense. His management roles would eventually lead him to direct the security and risk management efforts for his firm across the entire Americas region in all industry sectors. Robert Piraino has been involved in fencing for two decades, and has played the role of athlete, referee, coordinator and coach. He began fencing on his high school's varsity team in New York State where he earned several championship titles and honors. He continued his career as an athlete at The Ohio State University, where he was recognized as a Scholar Athlete and member of the very first Midwest Conference Championship Team. During his time at OSU, Robert was able to train with one of the world's most celebrated Fencing Masters, Vladimir Nazlymov. Robert took over the fencing program at Great Neck South HS where he coached the men's and women's teams to numerous championship titles, and earned several 'Coach of the Year' honors. Coach Piraino is a nationally rated fencer and referee in all three weapons, and holds an 'A17' rating in Epee, the highest national rating available. As well as earning the Gold Medal in Foil at the 2008 US National Championships, he was a finalist in Epee at the 2005 North American Cup, and a 5-time Empire State Games Medalist. In his three seasons coaching at Music City Fencing Club, two of his students have earned National Medals, one finishing in sixth place at the 2017 US National Championships (Division 2 Men's Epee), and one finishing in 8th place at the 2018 April North American Cup (Division 2 Men's Epee). Robert has also coached dozens of athletes to the Junior Olympics and US National Championships, as well as having countless students earn National Ratings. Coach Piraino also serves as the Chairman for the Tennessee Division of USA Fencing, Coordinator for the TN State High School Fencing League, and is a member of the U.S. Fencing Coaches Assoc.. He also holds a Safe Sport Certification with the U.S. Olympic Committee. Ron Chlasta has over 36 years of experience in all aspects of aquatic management and coaching at the elite level of USA swimming. As an administrator Ron began as the fitness and aquatics director of the Peninsula Community Center in Redwood City, CA. His ability to plan, implement, and maintain a quality facility resulted in being named the top aquatics program for clubs in Northern California in 1991. Ron and his wife Mary moved to Hendersonville, TN in 1995 and opened Sea Star Swim School. Now in their 23rd year of business they offer the most comprehensive and personalized aquatic program in the greater Nashville area. Ron was honored as the United States Swim School Association’s Outstanding Teacher of the year for two consecutive years in 1996 and 1997. He also served a three year term on the USSSA Board of Directors. COACHING – Ron began his career as the head coach of Calvin College Men’s team in Grand Rapids, MI. From there he developed an age group tem - Woodside Hills Aquatics on the San Francisco Peninsula. He produced numerous USA swimming top 16 athletes as well as two athletes who were named Pacific Swimmer of the Year. In addition, he had two athletes reach the #1 rankings on the NISCA High School All American list in 1995. Ron coached the Hendersonville High School Swimming Commandos for 6 seasons, where he produced 32 All Americans. He was named the 2014 Coach of the Year by the Middle Tennessee High School Swimming Association (MTHSSA). While he oversees his busy swim school, Ron currently coaches MTSC Masters an adult team in Hendersonville and has produced numerous masters national champions as well as an athlete who garnered a #1 world ranking in the 800 meter freestyle. Ron stays active in masters swimming and enjoys Open Water events. He has won several titles on the circuit at 1 & 2 miles – Del Mar Days ,San Diego, Semana Nautica, Santa Barbara, Castaic Lake, Los Angeles, and most recently Big Shoulders, Chicago. Ron has traveled internationally and conducted swim clinics with the national swim teams of Korea, Indonesia, Australia, New Zealand, and Guatemala. This past September, Ron was invited to lead the team building for the University of Michigan’s men’s and women’s swimming and diving program in Ann Arbor Michigan. Ron Chlasta is the owner of R&M Stables in Hendersonville. 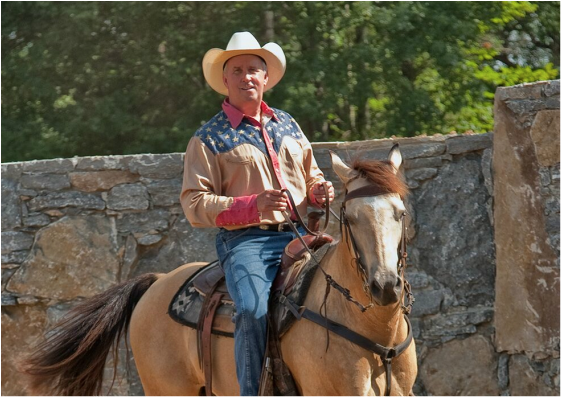 The facility is dedicated to teaching horsemanship from the ground up utilizing the western method of riding. As a rider Ron is the unit director of the County Mounties, a search and rescue/recovery team in Sumner Co. As a certified rider Ron has competed in the National Police Colloquium at the Kentucky Horse Park in Lexington, KY. He was the national champion in the tandem obstacle event for two consecutive years. In 2017 Ron’s horses won the event with Ron riding Trooper and Jason Parizek riding Geronimo. In Middle Tennessee, Ron’s horses have won the WHOA (Walking Horse Owners Association) championships in both individual and tandem obstacles. In 2017 his horse was the overall WHOA champion at the Miller Coliseum in Murfreesboro service horse division international championships. In 2018 Ron’s horse Trooper took top honors in equitation at the Williamson Co. expo center WHOA championships. Ron enjoys working with working with riders of all levels. He has developed a summer camp program and lesson program along with his program coordinator Casady Gammon that enables young people in the community to experience the many different entry points into the equine world.